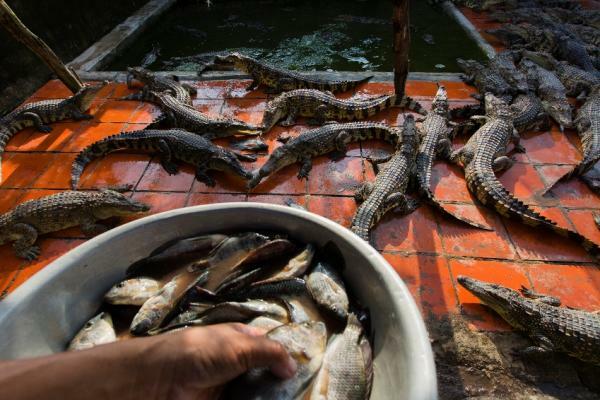 There are crocodile farms open to the public as so called zoos. What they actually are, is many animals crammed together in a small space under poor conditions, that are then slaughtered for their skins. The water in these cement pits is usually dirty and stagnant. Due to the lack of environmental enrichment the animals become aggressive and attack each other. It is therefore common to see wounds, bites, amputated limbs or tails and broken jaws in these animals. Many of these centers use the animals in shows where they are manipulated, provoked and harassed or beaten with sticks, the handlers sit on them, tie them up, pull their jaws or drag them around by their tail. Sometimes, these places define themselves as conservation centers to justify indiscriminate breeding and thus deceiving the visitors.